There is a wide range of birds in the Ornithology Collection from all over the world. Here are some interesting specimens from Ethiopia that were collected by Jack Hill II and Jack Hill III from 1973 to 1975 and donated to the collection. 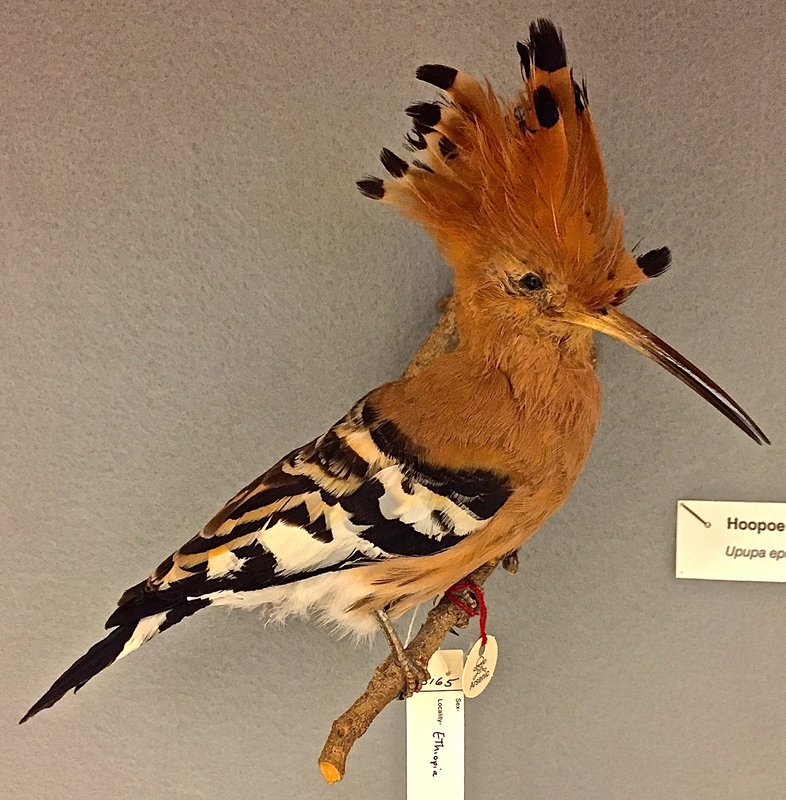 The Hoopoe (Upapa epops), pictured above, is found across Africa and Asia and is the national bird of Israel. It has a brown breast, black and white striped wings and a long, thin black beak. One of its more striking features is its crown of brown feathers tipped in black. The hoopoe eats a wide variety of food, from insects and small animals to berries and plants. The bird uses its long beak to forage and probe for food among grasses and in dirt. Eggs and brooding females give off a nasty odor to discourage predators and parasites. The Hoopoe appears in ancient Egyptian tombs and temples and ancient Minoans believed the bird to be sacred. There are also references to the Hoopoe in the Old Testament and the Quran. According to Leviticus and Exodus, the hoopoe is not kosher. 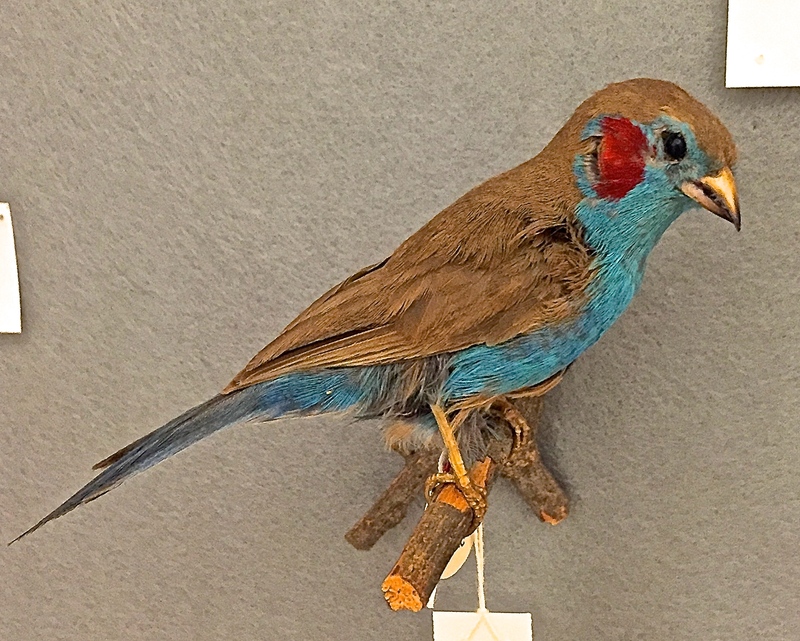 The Red-cheeked Cordon-bleu (Uraeginthus bengalus), found across Sub-Saharan Africa, is a member of the finch family. The male has a distinctive bright blue breast and bright red spots on its cheeks. Both the males and females of the species sing, and their song has been described as “wit-sit-diddley-diddley-ee-ee.” As a granivore, the cordon-bleu mainly eats small grains and other seeds. Females usually lay 4 to 5 eggs at a time. The Pin-tailed Wydah (Vidua macroura) is a small bird that lives all over Sub-Saharan Africa. Male wydahs are black and white with long, sweeping tail feathers and bright red beaks. Females are less bright: brown and off-white feathers and no tail plumage. Females lay eggs in nests of other birds, usually finches, which makes them brood parasites. During courting, males hover to allow females to see their tail feathers in a flight display. The Giant Kingfisher (Megaceryle maxima) is the largest kingfisher in Africa. Native to southern Africa, it has a black and white spotted back and chest, brown feathers around its neck, spiky feathers on top of its head and a wide, long black beak. The kingfisher’s cry sounds like “wak-wak-wak.” As a carnivore, its diet includes crab, fish and frog. The White-cheeked Turaco (Tauraco leucotis) is found in the northeast part of Africa. It has green feathers, black wings, and white spots on its neck and around its eyes. One turaco has been spotted numerous times around London over the past several years, and witnesses report that it seems to be thriving, despite the vast differences in climate. My name is Alexandra Goodman. 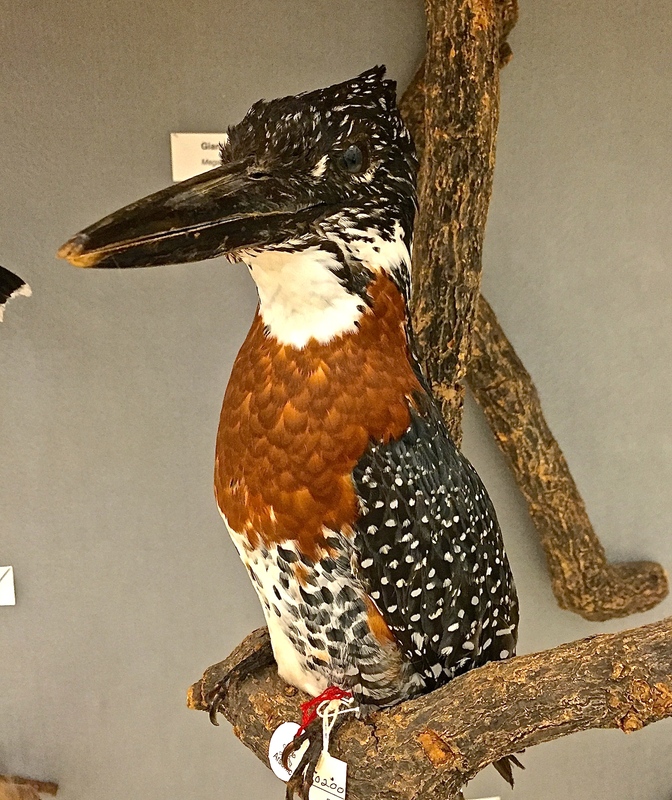 I’m a sophomore at the University of Oklahoma and a volunteer at the Ornithology Collection at the Sam Noble Museum. Writing is on e of my greatest passions. That’s why I’m currently working towards majoring in professional writing here at OU. I love working with words to craft a message that says precisely what I want it to say. My minors are German and art history. I also love museums. I have been to museums all across the country, from Norman’s very own Sam Noble Museum to the Metropolitan Museum of Art in New York City, from the British Museum in London to the National Air and Space Museum at the Smithsonian in DC. In these and in so many other museums, I have had awesome and exhilarating experiences learning about things I never would have before and witnessing other people’s joy and curiosity. I don’t know much about birds, but that’s part of what makes volunteering in the bird collection at the Sam Noble so interesting. I get to learn more about birds, more about museums, and at a museum that I’ve been coming to since I was a kid. Ultimately I would love to pursue a career that combines my love of writing and my love of museums in a way that tangibly helps other people learn about and enjoy the world. Every day brings me closer to that, and I can’t wait. I came up with the idea of starting a blog, because we have several wonderful volunteers who love to write. The Sam Noble Museum is well known for beautiful exhibits and popular education programs, but little is known by the public about our great research collections, where many passionate student and adult volunteers take a part in managing and improving the collections. Most of the posts here will be written by those volunteers and will share their experience with the Ornithology Collection and birds in general. 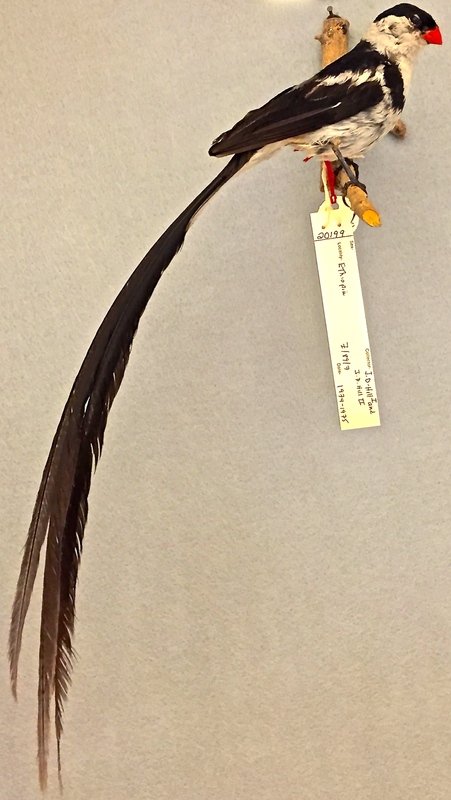 Oklahoma has a large community of bird enthusiasts, and we sometimes receive information on bird carcasses that can be used for our research or teaching collection. The carcasses we receive are prepared as study skins, skeletons, and/or spread wings, and their tissues are sampled for future genetic studies. These specimens will be used by researchers in Oklahoma and across the country for hundreds of years if they are maintained in good storage conditions free of pests and molds. 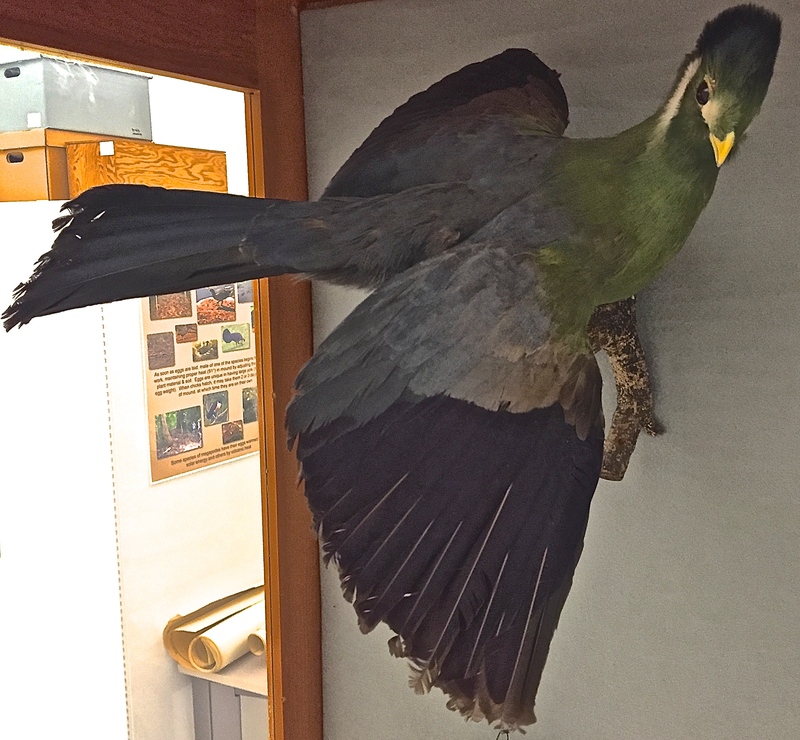 In this blog, we will feature some of the specimens that are contributed by the people from various parts of Oklahoma, who love birds and value our research in the museum.